BOT updates: It’s the second day of committee meetings for the Penn State Board of Trustees. Senior editor Lori Shontz ’91 reported on yesterday’s topics of discussion, which included potential changes to the presidential search process, the structure of the board, and alumni trustee elections. Check the blog for more updates this afternoon, and to watch the meeting live, visit WPSU‘s live stream starting at 1:30 pm. 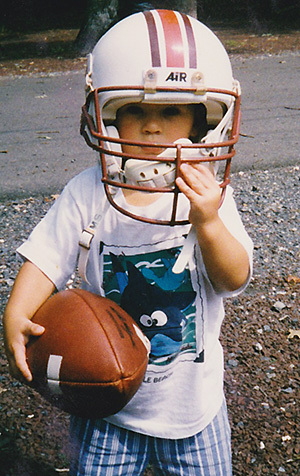 Courtesy of the Hackenberg family, via Grantland.com. Remembering JFK: Today marks the 50th anniversary of President John F. Kennedy’s assassination, and this morning, The Patriot News posted a collection of archival photos from JFK’s visit to Harrisburg in September 1960, and asked readers to identify themselves or others in the crowd. Recognize any Penn Staters? Dancin’ on a Stair: If you haven’t been out to the Pegula Ice Arena for a hockey game, GoPSUTV‘s video of student Devon Fields dancing up a storm to Bon Jovi’s “Livin’ on a Prayer” at last Friday’s game just might be the best advertisement for the new arena ever. The Nittany Lions lost to UMass-Lowell that night — but I think we all know who won the unofficial dance contest. Entry filed under: Board of Trustees. Tags: Christian Hackenberg, Devon Fields, John F. Kennedy.